We urgently need your help! 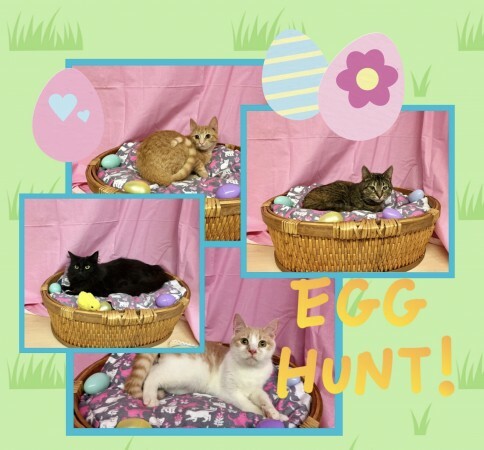 The only thing that is funner around Easter time than hunting for eggs is helping homeless kitties find their new home! $200 will cover the vetting costs of Duncan, Marigold, Selena and Sable and with YOUR gift, they will be safe. Don't delay and please, won't you help this quad of kitties? Our next transport is April 13 so we are hopeful we can load them up at that time! Please click on an open square to donate! If you're in a hurry, just enter the amount below you'd like to donate and we'll find you the best available square. Thanks to your help and help from others, Duncan, Marigold, Selena and Sable are now safe and confirmed to leave on transport this coming weekend. Arriving just in time to enjoy brave daffodils poking their heads up in the New England area, they are also on time to enjoy Easter and spring break in their new safe foster homes. Duncan, Marigold, Selena and Sable know you have many choices/options in your charitable giving and are so very thankful you chose to help them!! Thank you!! I’m helping "Darlington County Humane Society- Rescue" help this sweetheart get better. Please help too by donating or sharing with others. Thanks! I just made a donation to "Darlington County Humane Society- Rescue" to help this sweetheart get better. Please help too by donating or sharing with others. Thanks! Your generous donation goes directly to the PayPal account of Darlington County Humane Society- Rescue, less PayPal processing fees. GivingGrid.com does not take a fee from Darlington County Humane Society- Rescue. It's free to them.You do not need a PayPal account to donate. Click "Browse" and upload your favorite animal or other photo. Simply skip this if you don't want a photo added. Please help a little more to support GivingGrid's operating expenses and keep the service free to Darlington County Humane Society- Rescue. Why? Unlike most other services, we don't charge Darlington County Humane Society- Rescue any fees. It's free to them.